Dec. 24, 2015 -- It’s one thing to sit passively at a flight simulator to experience what it is like to pilot a plane. 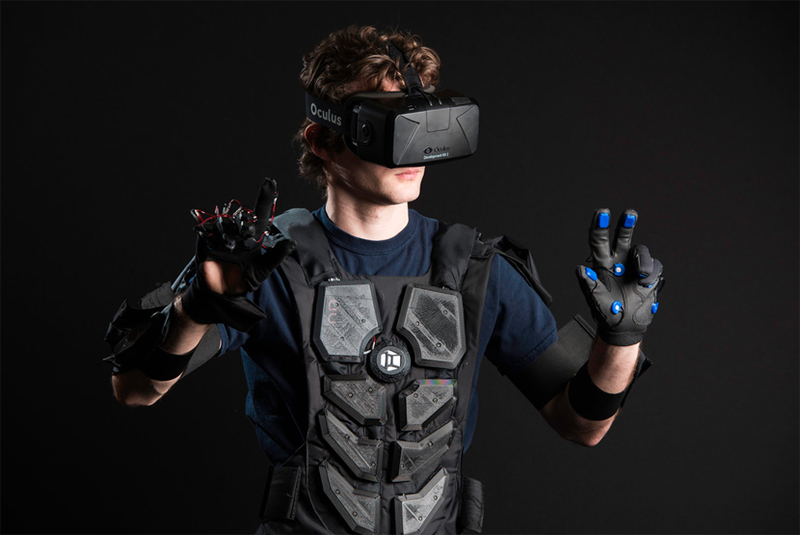 This is the “haptic” reality that NullSpace VR -- a team of current and former Hajim School students -- is preparing to bring to market with a haptic vest that slips right over the users’ clothes, plus gloves and peripherals. The vest is designed to be used with the new VR headsets coming on the market. “We want people to have this spatial virtual reality, where they can actually walk out and things look like they have a physical location around them,” explained Lucien Copeland, founder and CFO who has taken a break from his electrical and computer engineering studies to concentrate on this project. “We want them to be able to reach out and feel a virtual wall or feel something happen to them, and we want them to be able to see their own body as it happens. The technology could have other applications as well, such as simulating fires, crime scenes, combat scenarios – even Outer Space – in order to train firefighters, police officers, military personnel and astronauts with a high degree of realism. It could provide immersion therapy for victims of post-traumatic stress disorder. But for now, the team is concentrating on the virtual reality gaming industry, which is enjoying a resurgence as other groundbreaking VR technology – such as the new Oculus Rift virtual reality headset – come to market at the start of the year. The team will be sending out prototype kits to developers who can starting incorporating the technology into virtual games. “Our goal is to get feedback at every stage of the process, showing what people like and what they are using this for. This is critical to further design of the suit,” Copeland said. The team also includes founder and CEO Morgan Sinko ’17; founder and CFO Jordan Brooks, who is taking a break from mechanical engineering studies; Kian Jones ’17 of computer science, Alexander Matthers ’15 of biomedical engineering, Casey Waldren ’17 of computer science, Christian Freitas ’16 of biomedical engineering, Gary Ge ’16 of electrical and computer engineering and biomedical engineering, and Minsoo Lee ’16 of electrical and computer engineering. took second place and a $2,500 cash prize in the University’s Mark Ain Business Model competition. NullSpace is now part of the student incubator program at High Tech Rochester, sponsored by the Ain Center for Entrepreneurship. Copeland and Brooks credited the Department of Computer Science and two mentors on the faculty there – Randal Nelson and Ted Pawlicki – for “tremendous support” during the team’s early stages. 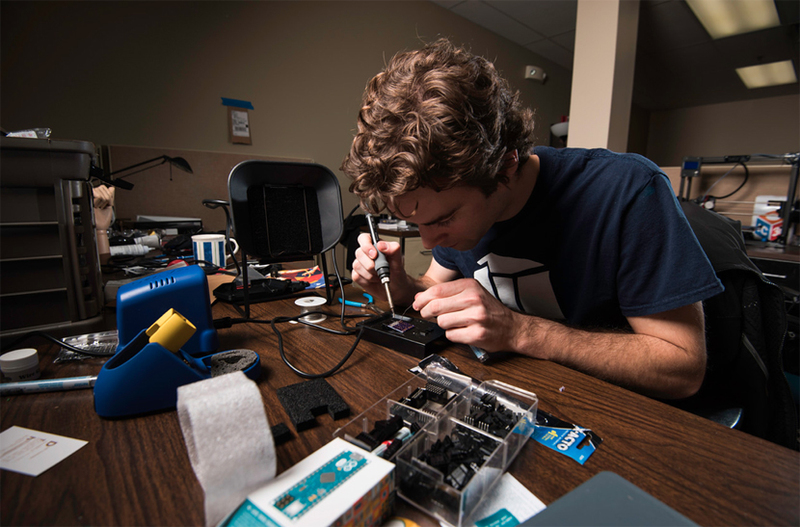 The departments of computer science, electrical and computer engineering and mechanical engineering “were all very generous in helping us afford flight costs during the competitions,” Copeland added. And the University’s Simon School of Business and Ain Center for Entrepreneurship have also been supportive. “Being able to apply to a space like this was exactly what we needed at exactly the right time,” Copeland said.